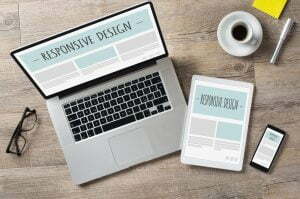 Responsive Web Design ensures your website will load correctly on any device, whether it’s a mobile phone, tablet, laptop and/or desktop computer. We always stay on top of the latest technologies when developing your website. Resize your web-browser on your laptop or desktop. As you shrink the window, you should see elements move around to fill the window. If you see a horizontal scroll-bar, the website is not mobile-friendly. According to Google, “Responsive design is Google’s recommended design platform“. No one knows Google’s search algorithm, however if Google publishes an article and recommends web designers adhere to certain practices, it’s probable and likely it’s a contributing factor in their search algorithm. Whether you have a website, or need a new one, we are here to help.